Anushka Sharma’s most chilling performance till date and you don’t wanna miss it. The story made me cringe a little. If you don’t think this movie is that scary, you probably won’t find it to be so. It isn’t James Wan horror, it has drama, suspense and a terrible villain. Anushka did a good job playing the role of a lost, clueless girl haunted by her mother’s spirit. I wouldn’t watch this movie again only for the cringe worthy scenes. Like the professor who takes his eye out of its socket. Ugh! There is another scene where an evil spirit plants his seed into women. It is so uncomfortable. I still can’t get that scene out of my head. The protagonist has acted alongside Vidya Balan in Kahani. To be honest, I liked his performance in that movie better. Not that he does not have the potential to take on a movie on his own, but this one didn’t work for me. Anushka has to get the poison out of her body, the only way to do that is either by attacking people or dogs. I felt so bad for all the strays. They did not deserve to be dead. One scene I liked was when Anushka gets hrer revenge and is unaffected by the spell being chanted because she has earphones plugged in. That was hilarious. Director Prosit Roy deserves a pat on the back from horror buffs. 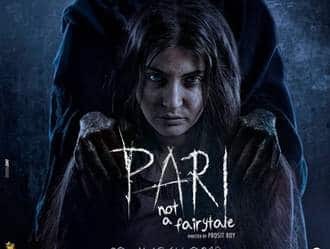 Even with a disjointed screen play Pari is far better a horror movie than what the other reliable horror makers of Bollywood have dished out. With a slight effort on the screenplay Prosit Roy could have probably given us our first ghost who even walks away with our sympathy. Actually Anushka does create some sympathy for herself in the movie. You are both scared of her and feel sad for her Rukhsana. That speaks volume about the character that Prosit Roy creates. The movie deserves once a dekho from all Bollywood horror fans because for a change the movie stays away from the regular bhoot in the corner tricks. In fact the background from which Rukhsana emerges is scary enough. I will not reveal that because it is scary enough to assume that someone has existed in his/her life like that. Parambrata gets another role worth noticing after Kahani and he does a very good job. His Arnab adds to the scary aura of Pari. Rajat Kapoor as the ghost slayer modern age professor is as usual effortlessly effective. He brings a certain ruthlessness to the front. Prosit Roy's biggest winner effort in this movie is of course the way he dilutes the boundaries between the good and the bad. By the climax you are not so sure if Rukhsana deserved to go the way she did. The scary scenes of Pari are derived from the fear its characters are feeling and that fear connects with you - that is the biggest brilliance of Pari - in most horror movies while the characters on screen are acting scared audiences are laughing loud not in most key scenes of Pari. That is a rare sight for a Bollywood Horror movie. This is one movie where after it ends you would want to ask the director to rework on it and release a second version with a better screenplay - you do not want to dismiss it as a bad movie - Pari is that good in the scenes that make impact. Definitely Not a Fairytale ?